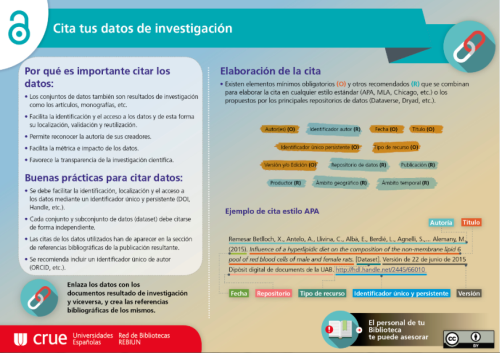 The data generated during an investigation begin to be recognized as a source of own knowledge and independent of the publications that have given rise (books, articles, papers) and not only because they serve to validate the conclusions presented in these publications, Can generate new knowledge and be exploited in an interdisciplinary way. A good management of the data generated in the development of an investigation guarantees its storage, accessibility and possible reuse. The material that comes from a single source and it is difficult, or impossible, to obtain it again. Data include statistics, results of experiments, measurements and observations resulting from the field study, surveys or interviews, images, etc. Research Data Management (RDM) encompasses all activities associated with the organization, structure, storage and processing of data used or generated during a research project. This management consists of making decisions and actions, prior to the creation of the data, during its creation and use and throughout its life cycle, with the purpose of guaranteeing its storage, accessibility and possible reuse. Improper data management can lead to loss of data or violation of privacy. Although data management does not imply open access, it is important to emphasize that open research data allow access and dissemination, freely and universally, and comply with the requirements of the official bodies that finance this research. The Open Data movement, under Open Access, defines open data as those that can be used, reused and redistributed without any restriction other than the allocation or sharing requirement. To identify usage permissions, there are several types of electronic licenses specific to open data sets. The most commonly used licenses are the Open Data Commons and the Creative Commons . Since January 2017 European projects funded by the European Union Research and Innovation Framework Program H2020 (with justified exception) will ensure open access to research data. 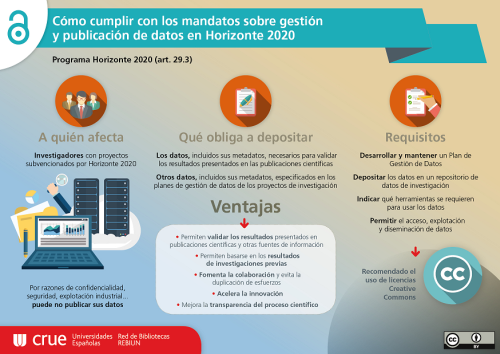 Projects participating in H2020 will develop a Data Management Plan (DMP), a first version of which is to be delivered during the first 6 months of the project and must deposit the data open in a repository. These projects should make the research data available locatable, accessible, interoperable and reusable. "As open as possible, as closed necessary"
The ethical and legal conditions impose a series of restrictions that must be taken into account during the entire data life cycle (intellectual property, industrial property, privacy or secrecy and protection of personal data). A Data Management Plan (DMP) is a formal document to be carried out at the beginning of the research, which describes what we will do with the data during and after the end of the research, and which can be modified to Throughout the project. The DMP specifies the topics on collection or creation, organization, documentation, sharing and preservation of data. As we have indicated is mandatory for the projects participating in H2020 and should include the following steps (PGD Online). DMP Online : developed by the Digital Curation Center with a template for the European Commission's H2020 projects. PAGODA : translation into Spanish of the DMP Online tool, made by the Consorcio Madroño. DMP CSUC : translation into Catalan of the DMP Online tool, carried out by the CSUC. 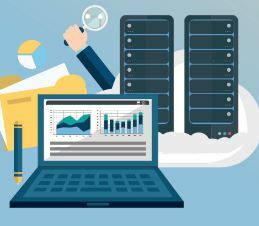 The data can be stored in repositories or in the editorial platforms along with the publications in the case of certain magazines that allow this option. The repository selected to deposit the data must guarantee long-term preservation, ease of recovery and access to them. Thematic repositories: include research data from a specific disciplinary field. They can be located through the re3data irectory . Zenodo : multidisciplinary and international repository of research data, funded by the OpenAIRE project and recommended for European projects. Citing the research data guarantees its identification, location and a correct attribution to its creators. The data should be cited just as it does with the publications. There are different formats for citing data sets and each discipline usually uses a particular style of appointment, as with articles, monographs, chapters, etc. DOI Citation Formatter is a service offered by DataCite that automatically builds appointments according to the style we select from the DOI assigned to the data.